Cough and congestion is one of the most common problems faced by literally everyone – from infants and kids to adults. Chest congestion is an infamous infection of the respiratory system. In congestion, the lower tract of your respiratory system experiences inflammation, which finally leads to difficulty in breathing. Coughing and sneezing are the most common symptoms of congestion. Cough and congestion could be cause of because several reasons, but it is mostly caused due to changing weather. Winter is about to go and this is the time when we need to take some precaution to avoid cough and congestion. But if you are already suffering from cough and congestion and wondering about the best ways to cure cough and congestion then here’s the post worth checking. Because today in this post I am going to share with you my all time favorite and most effective ways to cure cough and congestion naturally and easily. Drinking fluids is the most common and effective way of beating the disease. Warm liquid dissolves and flushes out the mucus, which leads to relief from congestion. Steam or humidifiers can also be an immense help when fighting cough and congestion. Honey or essential oils are also the usual go-to while treating cough and congestion. Topical application of vapor rub might not be a natural way but is definitely a very popular and effective way to get rid of the mucus and scratchy throat. If you live in a busy city then pollution might be one of the causes of cough. Drinking hot tea or coffee soothes the coughing reflex and helps the immune system get rid of the excess mucus causing congestion. The over-the-counter cough drops or lozenges do help with cough and congestion but, sometimes, they have counterproductive side effects. Like, cough drops and cough syrups tend to make you drowsy and sleepy. Therefore, let’s keep away the synthetic drugs and learn more about the natural ways to get rid of cough and congestion. Drinking fluids is very helpful in treating chest congestion. Fluids at a temperature warmer than the room temperature, is more useful in treating all the symptoms of common cold, especially cough and congestion. They are also helpful in reversing the effects of dehydration. Ginger tea is especially helpful in fighting cough and congestion. Pour a cup of water in a saucepan and add chopped ginger in it. Bring it to boil and add tealeaves. Let it infuse for 2 minutes. Strain and add honey to sweeten. Besides hot tea or coffee, you can also turn to chicken soup for relief from congestion. Chicken soup is rich in the natural amino acid called cysteine. N-acetyl cysteine, a form of this amino acid is a natural anti-oxidant that boosts our immune system. To make chicken soup even more effective of a cure you need to spice it up with garlic, red hot peppers, Tabasco sauce or hot curry sauce. Hot peppers and garlic provide added pungency and heat which flushes out the congestion causing excess mucus. If your eyes start watering or you get a runny nose, then it is a sign that it is working. Your body is reacting to loosen up mucus and cough up mucus to relieve you of the congestion. Although every chicken soup recipe works well, here is my favorite one. It is simple and easy to make. Melt one tablespoon of butter and fry chicken until it is light brown. Keep stirring it for 5 minutes. Add chicken stock, carrots, peppers, chopped garlic, onion, rice, parsley and salt to taste. Cover and let it simmer over low heat. Let the rice cook, which will take about 20 minutes. Your soup is ready! Drinking tea or warm lemon water with honey is the most popular treatment to soothe a sore throat. Honey has antimicrobial properties that aids in eliminating bacteria, virus or any other microbe causing cough. It is a natural antioxidant that boosts the immune system and provides better protection against germs. Honey is also a natural demulcent that forms a protective layer over the mucus membranes and soothe an itchy throat. It is anti-inflammatory and rich in enzymes that protect the body against infections. Honey is a well-known natural cough suppressant. To treat cough and congestion, take one spoon of honey thrice, daily until your symptoms decrease. Do remember to take it once before bedtime so that night time coughing do not disrupt your sleep. For toddlers and kids below the age of one year, one spoon per day is effective to reduce the symptoms of cough and congestion. Another method of using honey to treat congestion is by mixing it with pepper. Mix one spoon of honey with one spoon of freshly grounded black pepper and pour one cup of water in it. Stir it until the pepper flakes and honey dissolves well in the water. Leave it for ten minutes and then stir it to drink. Drink this twice daily until you get rid of the excess mucus. The phlegm increase in our lungs and inflammation of airways are the two reasons of congestion, when you catch a cold. Dilating the air passage is the solution for both, which leads to air flowing freely through them. Breathing in steam helps relax the diaphragm muscles, clears the airways and regulate normal breathing. As the lungs and air passage becomes unblocked, you start to expectorate. Steam is a chemical-free natural remedy to get rid of cough and congestion. Hot steamy showers of steam baths should last about 10-15 minutes but not more than that. Repeat the process twice daily, until you get relief from the discomfort. You can also inhale steam to get rid of the congestion. Add a few drops of eucalyptus oil in it for better results since eucalyptus oil is analgesic and has antibacterial properties. Another less known steam treatment for congestion is inhaling the vapors of vinegar. Boil vinegar and inhale its vapors to get quick relief from cough and chest congestion. According to Dr. Philip T. Hagen, the editor-in-chief of the mayo Clinic Book of Home Remedies, a saline solution, being hypertonic to our body fluids, draws out the excess fluid through osmosis, making our throat tissues hurt less. Gargling loosens thick mucus and flushes out cough causing irritants from our throat. Add half spoon of salt in a glass of warm water and gargle with it for a few seconds before spitting it out. Repeat this process until you get relief from the cough and congestion. Licorice root or Glycyrrhiza glabra is a traditional herb used commonly to treat cough and congestion. It is a natural expectorant that clears chest congestion from the lungs and bronchus. Licorice is also anti-bacterial, anti-inflammatory and a natural demulcent. To make licorice tea, add one spoon of dried herbs to two cups of water and bring it to boil. Let it steep until your tea becomes as strong as you want, preferably 5-10 minutes. Then strain the tea and drink it. You do not need to add any sweetener, as licorice itself is sweet. Remember to drink the tea without milk or cream to get relief from the cough. Parsley is, known to cure cough and stop the excess production of mucus. Chewing on parsley leaves helps the mucus to thin out and provides relief from the pain of chest congestion. It is also beneficial against chronic allergies like sinusitis. Throw in a handful of parsley leaves in a quart pot and let it simmer like tea. Strain and drink this as often as required to get rid of cough and congestion. Onions are rich in sulfur that has antibacterial qualities that kills the cough causing microbes. It strengthens the immune system and acts as an expectorant by loosening the mucus. It also happens to have anti-inflammatory properties that bring down the inflammation of the air passage. Onions are also well-known cough suppressant. An onion broth is ideal to help you get relief from cough and congestion. Chop an onion in four pieces. Put the onions in a pot and pour 16 ounces of water in it. Bring it boil and then reduce heat and let it simmer for about 15 minutes. Then remove the pot from heat, let it cool and drink it. Keep repeating the process throughout the day to flush out the excess mucus and relief from coughing. To get relief from coughing and chest congestion roast some fenugreek, clove and carom seeds for 3 minutes and drop them on a clean cloth, thin piece of cloth. Put this hot pack over throat and chest to get relief from throat inflammation and chest congestion. Mustard paste is really useful in treating cough and congestion. If you feel a burning sensation on applying the plaster then remove it immediately. Mix one part of dry mustard with four parts flour and add water to make a paste. Spread the paste on a washcloth, rub olive oil on your chest and then put this washcloth on your chest. Leave it there until it cools down. Cayenne pepper is a natural analgesic. If you are coughing because your throat hurts or tickles then, cayenne pepper will help soothe the irritation. Cayenne also loosens the mucus and clears the nasal passage for smooth flow of air. 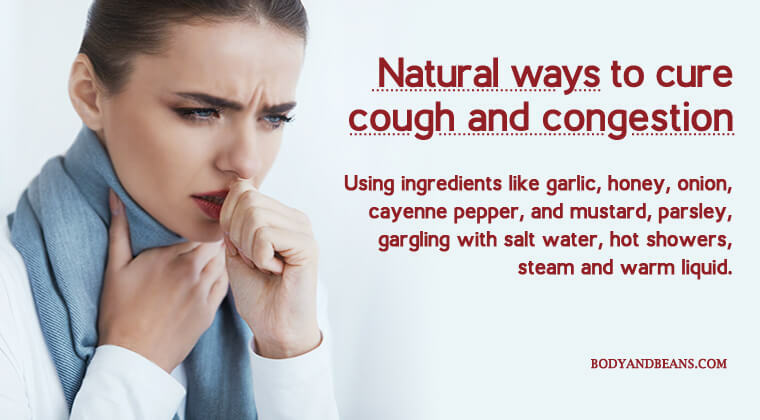 Sprinkling cayenne on your food will also help you deal with cough and chest congestion. You can mix one-quarter spoon of cayenne pepper in a cup of water and sip on this slowly. Alternatively, you can also make a tonic with cayenne pepper for your cough. Mix a quarter spoon of cayenne pepper and ground ginger each with one spoon of honey, one spoon of apple cider vinegar and two spoons of water. If the coughing is bad take three spoons of this otherwise one is okay. This tonic is suitable for adults only and not for kids. Garlic is a natural decongestant and expectorant. It also has anti-microbial properties that keep the flu at bay. Garlic is rich in Vitamin C and a lot of other enzymes and minerals like selenium and sulfur. Eating fresh garlic will greatly reduce the coughing and congestion. Eating raw garlic causes a chemical reaction that secretes an anti-bacterial called allicin. Allicin is present only immediately after the garlic clove is, crushed and before it is heated. To consume garlic, mince one clove of garlic and leave it like that for 10-15 minutes for allicin to develop. Then spread it on toast with honey or butter. Rubbing garlic oil on back and chest is also quite beneficial to remove congestion. To make garlic oil, add four to five cloves of garlic in a pan and add four spoons of olive oil. Heat the garlic but do not let it turn brown. Maintain this low heat for 20-30 minutes and then strain the garlic to get the oil. This oil will remain fresh in the refrigerator for about two weeks. The season is becoming warmer steadily and this is the time to keep the remedies for cough and cold handy. Warm fluids, hot showers, mustard, garlic, honey, cayenne pepper, licorice, gargling with salt water, parsley, hot pack, onion – all these ingredients can be used as remedies to cure cough and congestion. Throat pain, inflammation, itchy throat and chest pain are all symptoms of a congested chest and cough. Before it leads to something big like bronchitis, start using the natural remedies to nip the disease in the bud. Although all the ingredients are natural, some ingredients may have side effects or allergic reactions. Like, honey should not be given to a child below one year without pasteurizing or boiling it. Cayenne pepper has been known to cause stomach irritation and messes with medicines like antacids and blood thinners. If you are facing any trouble with the ingredients or the coughing is persistent for more than a week then consulting a doctor is suggested. Coughing and chest congestion, are sometimes caused by diseases like bronchitis, pneumonia, tuberculosis etc. Diseases like, this, cannot be treated naturally and you need to consult a doctor for treatment. Other than this, if it is, caused by the common cold then you can use the remedies discussed above to cure cough and congestion easily. Are you suffering from a cough? Does your chest feel tight? Try one of these remedies today to get relief. 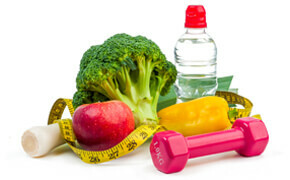 Until then, stay fit, stay healthy! Good evening. Thanks a lot for sharing this excellent article.